Wandering around in the Botanical Garden a few days ago, we relied on an autofocus to deliver a sharp subject while we concentrated on composition. The trouble was, though, that the camera didn't always agree with us on what the subject was. Autofocus. We struggled with focus on this image, finally closing the aperture down to f7.1 to get more curls into the focus plane. So while the camera focused on a Canada goose pecking at the grass, it missed Joyce in the shade in favor of the bright row of hedges behind her. Sometimes it preferred a nearby leaf to the bright bud a bit further away. We hop between a dSLR, a Micro Four Thirds and a smartphone camera all the time. They all make mistakes like this. So we're going to protect the guilty and focus on what you an do about it. You know, we're going to solve this bugger. 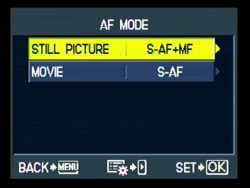 On a dSLR, you have a lot of options but the simplest approach is to override autofocus with a manual tweak. Find the focus ring at the front of the lens and give it a little twist to sharpen focus after auto has done its thing. Manual Focus Rings. Very narrow, knurled rings at the front of three lenses. Single Point, typically the center of the frame. Some photographers just put their subject in the middle of the frame, half-press the shutter (or hit the Lock Focus button) to set focus and then reframe the composition. Dynamic, a moving single point. You pick a number of hot spots in the frame (something between 9 or 51) that are monitored for a subject or that you pick among for the hot spot. Takes the auto out of autofocus. Auto Area, in which as much of the frame as possible is live (although that often isn't much outside the central area) and you take your chances. 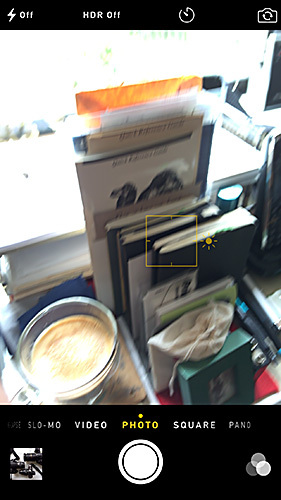 Puts the auto back in autofocus but sometimes leaves the focus out. Imperfect approaches like these are sometimes useful in particular situations. And, anyway, you'll have to chose one as your default. We'll leave auto tracking, which simply is your camera's ability to follow the subject as it moves in the frame, out of the discussion for the moment. But keep it in the back of your mind because it's ideal for moving subjects. But a manual tweak is the simplest solution because it gives the intelligent nut behind the wheel final say. 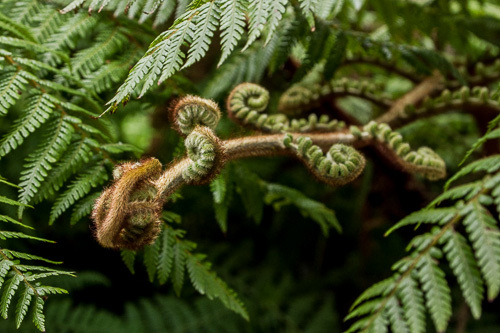 Just half press to let autofocus get the ball rolling and twist the focus ring on your lens to finish the job. Phone Phocus. The yellow target is where we tapped to set both focus and exposure. On your smartphone, life is even simpler. Not better, just simpler. You start with a wide angle lens so everything across the table to the horizon is in focus. But what about when you want to focus on the food on your plate and not the plate next to you? You just tap the image of your plate on that gorgeous large LCD to set focus manually. Could not be easier. We don't even know why we're describing it. Except, ahem, it can come with complications. Like locking exposure as well as focus. If that doesn't fly for you, upgrade your camera app to one of the more complicated ones available. For some silly reason you might think an interchangeable lens system like a Micro Four Thirds would function the way a dSLR does. There's autofocus, there's a focus ring. What's the big deal? We have a theory about that. 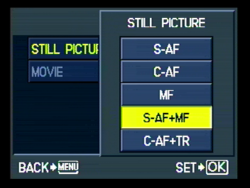 Everything a compact camera can do was conceived during the design of the menu system. There are no mechanical precedents. If it isn't specified on a menu, it won't get built. In the field, that translates to: it may as well not exist because you can't find it in the menu system. The solution is to emulate the dSLR solution. But getting there requires a swath-cutting adventure through the menu system. Even though the menu system has no secrets, a lot of it is buried and covered over with confusing, duplicitous tabs. You need a guide. And your camera's manual is that guide. It always makes us nervous to hit the manual's index only to find a single page devoted to the subject we're exploring. We know that single page will reference about five other parts of the manual and include unreadable footnotes with more obscure references. Not to mention a few line drawings to throw us off course. Manuals are notoriously bad. Camera manuals criminally so. But they're also indispensible. You may find the PDF version easier to deal with than the paper version but that's the only tip we can offer. 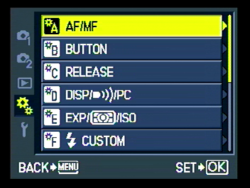 AF Menu. Three settings to adjust. You can see all of them in seen in the Stills Options screenshot below. 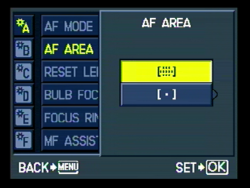 We also want to choose between Area and Spot focusing. We've graduated from relying on Spot focusing, trusting Area focusing to evaluate the scene and select what matters. It usually works well with less effort than Spot. And with our manual assist, it will be all we'll need. Intelligent evaluation of the scene from both the camera and the photographer. AF Area. Area or Spot. In a footnote in the manual's section of autofocus there's a reference to another part of the manual which explains how to enable Manual Focus Assist. That's an automatic enlargement of the image in the display to aid precise focusing. You want that. In theory anyway. 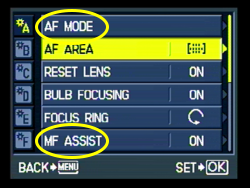 The concept of Manual Focus Assist makes sense but the implementation may be, as it was for us, annoying. It shouldn't have been. Twist the focus ring and the display should zoom. But we found half-pressing the shutter and zooming the lens confused that operation enough that we were often thrown into a zoomed display with no idea where our subject went. Also complicating things is that the zoomed display crops to the center of the frame. If you want to focus elsewhere, you've got an awkward problem. 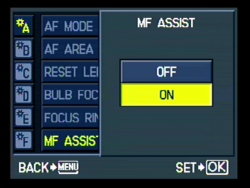 The solution isn't to give up Manual Focus Assist. It's just to turn off its automatic implementation. It turns out we can zoom the display during focus with the Magnification button. You know, when we want, not when the camera thinks we need it. Manual focus itself used to be the only game in town. Autofocus is a great convenience you will almost never want to give up. Even if it isn't entirely reliable. But you can have the best of both worlds no matter what kind of camera you have. Just override auto with a manual tweak. It isn't always easy to set up, but it's worth it. Because sometimes those hard to focus images are the most interesting in the batch.